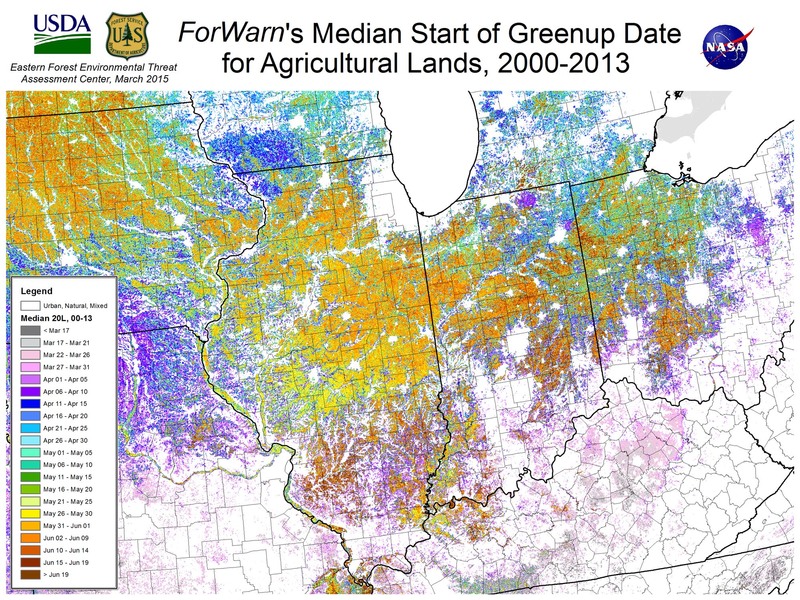 Understanding the normal start of greenup for croplands is important because it provides a baseline to compare year to year conditions. 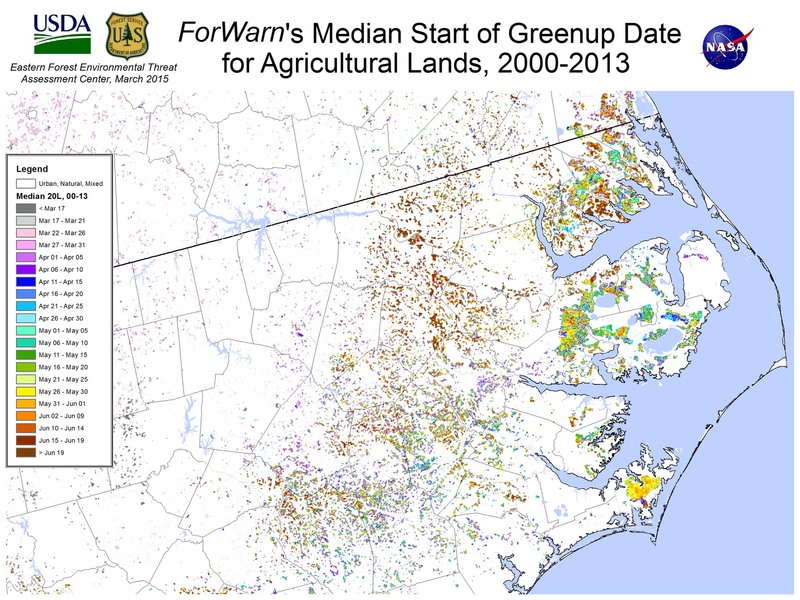 The date of greenup for agricultural lands varies based on year-to-year climate factors, the unique responses of the specific crop or vegetation type planted, and farmers' management practices. 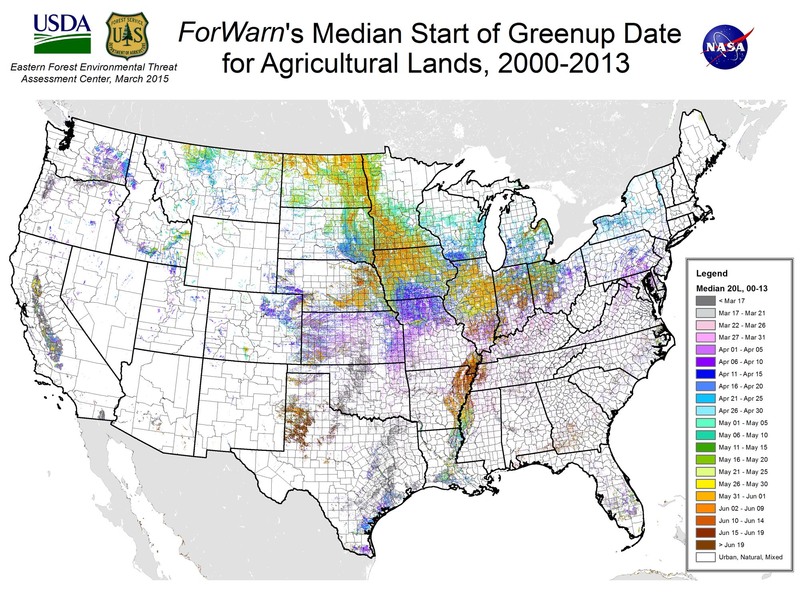 For areas that need to be planted in the spring, wet late winters can delay planting. Cool springs can delay growth. Either can potentially influence seasonal growth and yield. Therefore, understanding the conditions early in the growing season is useful for tracking the crop success months later. 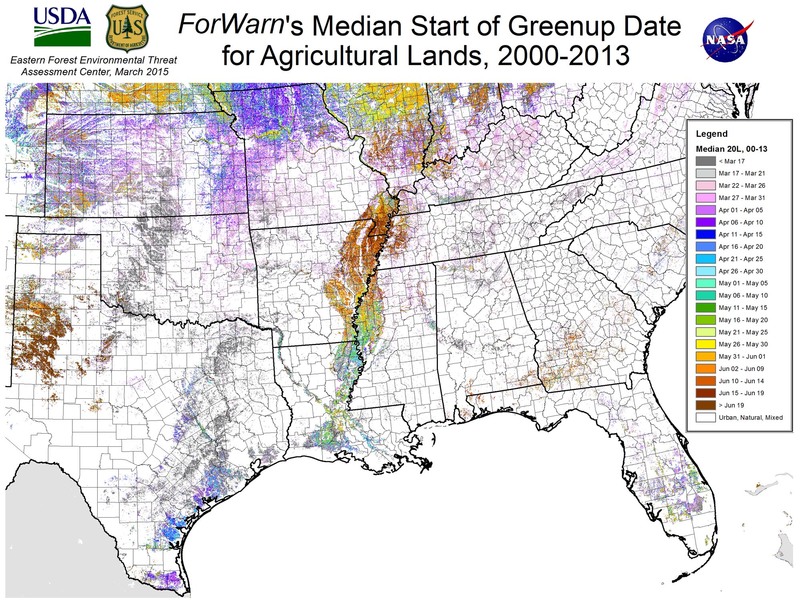 ForWarn defines start of greenup as the date when each MODIS grid cell has reached a 20 percent increase above its early winter minimum NDVI, relative to the subsequent summer maximum. The croplands shown on these maps were filtered by the 2006 National Land Cover Dataset and were rescaled to MODIS resolution based on majority land cover type. 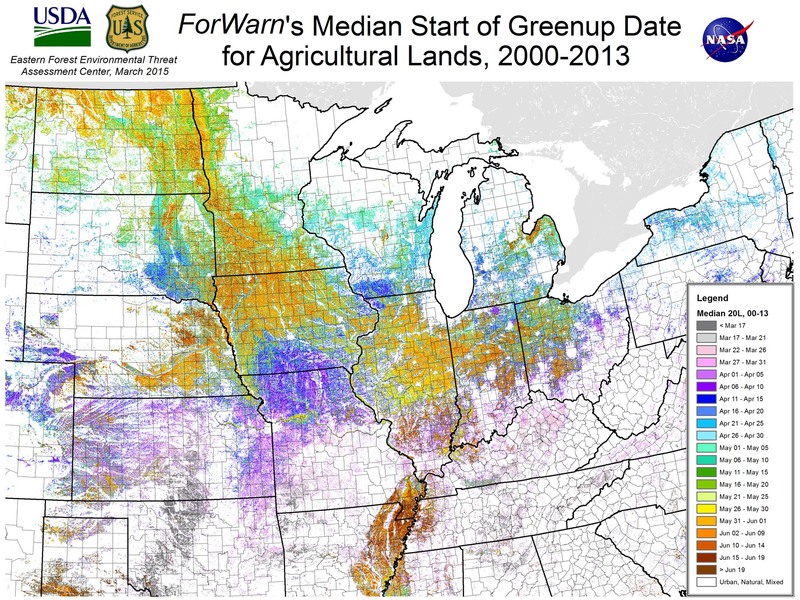 In the Midwest, the start of greenup on croplands is normally considerably later than for the surrounding natural vegetation. Deciduous forests are composed of long-lived perennials that respond to warming temperatures or the lengthening photoperiod of spring. Natural herbaceous plants and grasses can similarly respond quickly once spring arrives. In contrast, most crops are annuals that require mechanized seeding and germination before greenup is detectable from space. 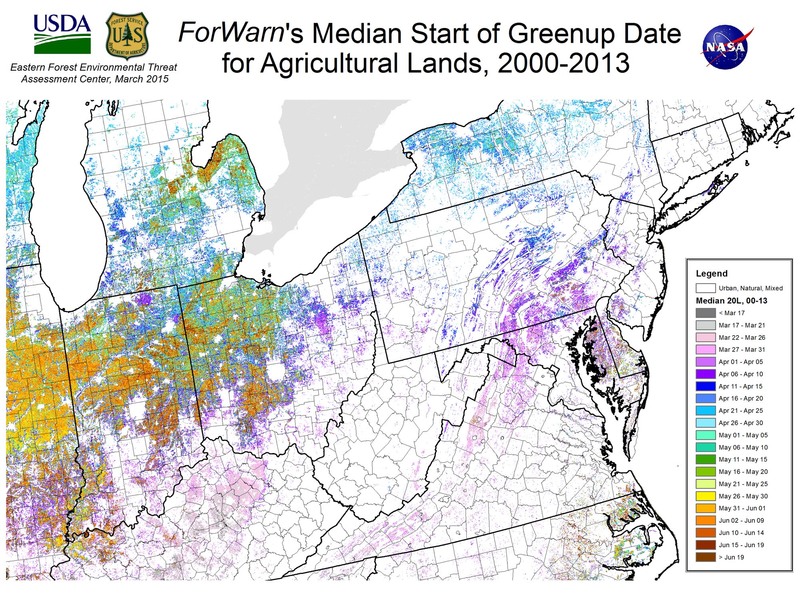 This delay causes sharp differences in the date of normal greenup between crop and natural vegetation. 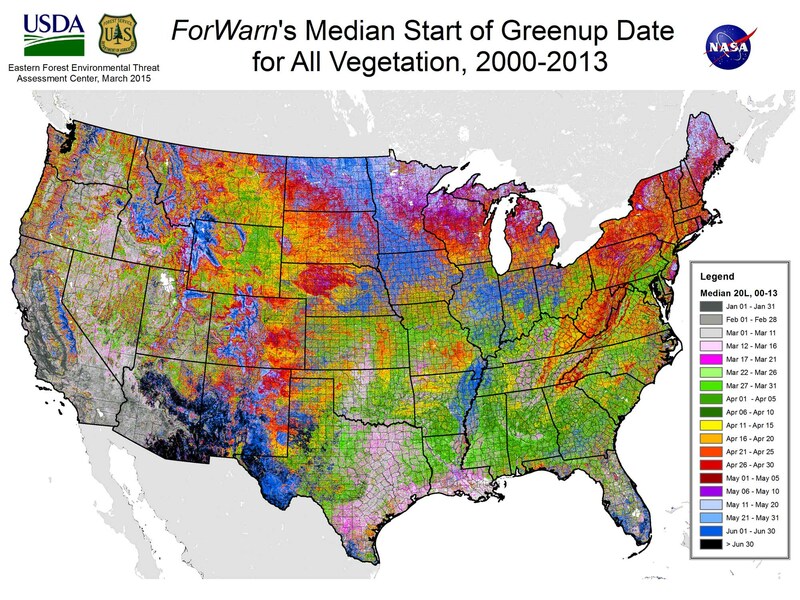 Microclimate can also cause differences in start of greenup. 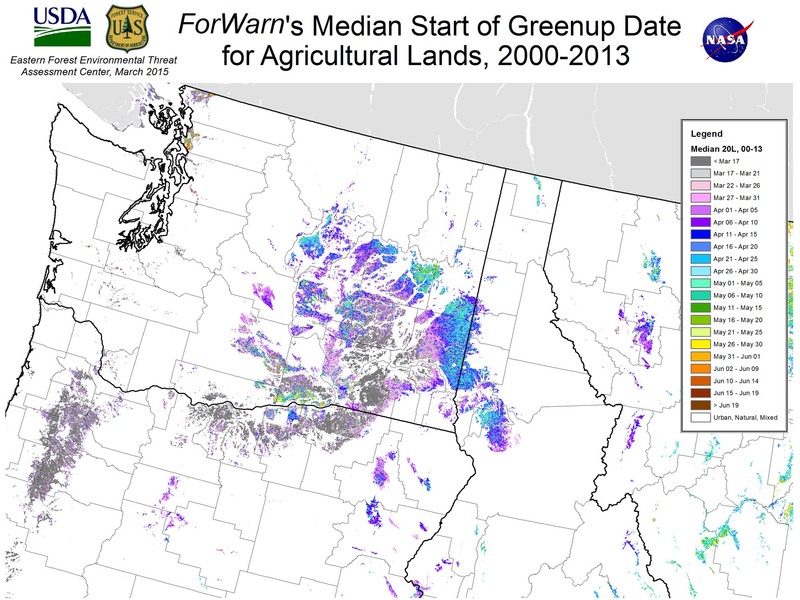 In Washington state, green-up of winter wheat tracks elevation, as warmer temperatures arrive a higher elevations later in the year. Within-region differences are often caused by different crop types, as seen in the greater Mississippi valley and eastern North Carolina.